The aim of this study is to investigate the contribution ratios of Growth rates and specific motor abilities as a function to predict the selection of talented taekwondo sport. The study was carried out on a sample of (755) individual Clubs and youth centers across the governorates of Egypt, and the average age (11.64 ± 0.48 years), height (144.06 ± 7.04 cm) and weight (36.86 ± 7.51 kg). Tests were conducted in the period from 7/11/2011 to 29/12/2011 selected individuals underwent the following tests and measurements (Ability, Hinge flexibility basin, Agility, Kinetics speed in level trunk, Kinetics speed in level face, Endure Performance, Performance ), the researcher used the descriptive survey method. The statistical analysis SPSS was used to apply formulas statistical by calculating: average, standard deviation, correlation, stepwise regression. The results showed that the growth rates and special motor abilities contribute to the selection of talented taekwondo. In addition, taekwondo players are characterized by flexibility, Endure performance and motor speed. The study concluded that there are five factors affect the selection of talented junior Taekwondo detailed flexibility contribute (28.8%), endure Performance contribute by (15.1%), ability contribute (7.8%), Growth rates (age, length, weight) a contribution rate (5.2%), kinesthetic speed motor (in the level of the trunk - in the face level) (1.1%). Predictable talented selection junior taekwondo through the following equation = 49.835 + Age (-0.389) + Length (0.157) + Weight (-0.188) + Flexibility (-0.359) + Ability (0.081) + Agility (-2.261) + Endure Performance (0.608) + Kinetics speed motor in the level of the trunk (0.586) + Kinetics speed motor in the face level (0.260). These results should be taken into account by the taekwondo Federation and trainers for use as an indicator for selecting talented taekwondo sport. Ahmad SZ. The relationship between the measurements anthropometric examination and the ability to jump to the team players taekwondo Egyptian. The scientific magazine of the college of sports education for boys, Helwan University, 2003. Ahmed SZ. The rules of scientific and artistic motor taekwondo. Note by non-published, 2007. Atsumi T, Iwakura I, Kashiwagi V, Fujisawa S, Ueha T. Free radical scavenging activity in the nonenzymatic fraction of human saliva: a simple DPPH assay showing the effect of physical exercise. Antioxid Redox Signal, 1999; 1: 537-546. Battino M, Ferreiro MS, Gallardo I, Newman HN, Bullon P. The antioxidant capacity of saliva. J Clin Periodontol, 2002; 29: 189-194. Bortner CA, Miller RD, Arnold RR. Effects of alpha-amylase on in vitro growth of Legionella pneumophila. Infect lmmun, 1983: 44-49. Chicharro JL, Lucia A, Perez M, Vaquero AF, Urena R. Saliva composition and exercise. Sports Med, 1998; 26: 17-27. Davis JK, Green JM. Caffeine and anaerobic performance: ergogenic value and mechanisms of action. Sports Med, 2009; 39: 813-832. Ebada KH. Anthropometric measurements, somatotypes and physical abilities as a function to predict the selection of talents junior weightlifters. Journal of Science, Movement and Health, 2013; 13(2): 25-36. Ebada KH. Die Probleme des Trainings von Gewichthebern kindes- und Jugendalter. Dissertation, Germany, 2003: 6063. Ebada KH. Growth rates as a function of predict the results of the Olympic players in the sport of weightlifting, First Scientific Conference "college sports in the Arab countries in the period from 6-7 February 2006. Faculty of Physical Education, Mansoura University, Egypt, 2006. Gaurav V, Singh M, Singh S. Anthropometric characteristics, somatotyping and body composition of volleyball and basketball players. J of Physical Education and Sports Management, 2010; 1(3): 28-32. He CS, Tsai ML, Ko MH, Chang CK, Fang SH. Relationships among salivary immunoglobulin A, lactoferrin and cortisol in basketball players during a basketball season. Eur J Appl Physiol, 2010; 110: 989-995. Jespersgaard C, Hajlshengallls G, Russell MW, Michalek SM. dentification and characterization of a nonimmunoglobulin factor in human saliva that inhibits Streptococcus mutans glucosyltransferase. Infect Immun, 2002: 70(3): 1136-1142. Kromeyer K, Wabitsch M, Kunze D. Perzentile für den Bodymaß-Index für das Kindes- und Jugendalter unter Heranziehung verschiedener deutscher Stichproben. Monatsschrift Kinderheilkunde, 2001; 149: 807-818. Mohamed SH. Factor analysis of physical ability. Dar El faker Ela Raby Thought, 1996. Murakami S, Kurihara S, Titchenal CA, Ohtani M. Suppression of exercise-induced neutrophilia and lymphopenia in athletes by cystine/theanine intake: a randomized doubleblind, placebo-controlled trial. J Int Soc Sports Nutr, 2010; 7: 23. Nater UM, La Marca R, Florin L, Moses A, Langhans W, Koller MM, Ehlert U. Stress-induced changes in human salivary alpha-amylase activity associations with adrenergic activity. Psychoneuroendocrinology, 2006; 31: 49-58. Sjodin B, Hellsten Westing V, Apple FS. Biochemical mechanisms for oxygen free radical formation during exercise. Sports Med, 1990; 10: 236-254. Thrane PS, Rognum TO, Brandtzaeg P. Ontogenesis of the secretory immune system and innate defence factors in human parotid glands. Clin Exp lmmunol, 1991: 342-348. Tsai Ml, Chou KM, Chang CK, Fang SH. Changes of mucosal immunity and antioxidation activity in elite male Taiwanese taekwondo athletes associated with intensive training and rapid weight loss. Br J Sports Med, 2011; 45: 729-734. Tsai Ml, Ko MH, Chang CK, Chou KM, Fang SH. Impact of intense training and rapid weight changes on salivary parameters in elite female Taekwondo athletes. 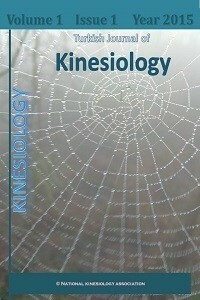 Scand J Med Sci Sports, 2011; 21: 758-764. Walsh NP, Laing SJ, Oliver SJ, Montague JC, Walters R, et al. Saliva parameters as potential indices of hydration status during acute dehydration. Med Sci Sports Exerc, 2004, 36: 1535-1542. Walsh NP, Montague JC, Callow N, Rowlands AV. Saliva flow rate, total protein concentration and osmolality as potential markers of whole body hydration status during progressive acute dehydration in humans. Arch Oral Bioi, 2004; 49: 149-154. West NP, Pyne DB, Renshaw G, Cripps AW. Antimicrobial peptides and proteins, exercise and innate mucosal immunity. FEMS lmmunol Med Microbiol, 2006: 293-304. Yang OJ, Hwang lS, Lin JT. Effects of different steeping methods and storage on caffeine, catechins and gallic acid in bag tea infusions. J Chromatogr A, 2007; 1156: 312-320. ISNAD Bakr, Mohammed Mustafa . "Growth rates and specific motor abilities as a function to predict the selection of talents taekwondo sport (Egyptian national project)". Turkish Journal of Kinesiology 2 / 1 (July 2016): 1-5.